I accept whatever you give me. I do whatever I am told to do. I do not presume to change anything you think, say or do; I file it away in perfect order, quickly and efficiently, and then I return it to you exactly as you gave it to me. I am the reservoir into which you toss anything your heart or mind chooses to deposit there. I work night and day; I never rest, and nothing can impede my activity. The thoughts you send to me are categorised and filed, and my filing system never fails. I am truly your servant who does your bidding without hesitation or criticism. I cooperate when you tell me that you are ‘this’ or ‘that’ and I play it back as you give it. Since I do not think, argue, judge, analyse, question, or make decisions, I accept impressions easily. I am going to ask you to sort out what you send me, however, my files are getting a little cluttered and confused. I mean, please discard those things that you do not want returned to you. What is my name? Oh, I thought you knew! Regarding consciousness, it is unfortunate that today our mode of thinking is that consciousness only comes from the head, mind or brain. It doesn’t! The brain is an organ that directs consciousness in a certain direction, and the mind can ramble on in strange ways and want things that the body and soul do not want. There is also a body consciousness, for example, when we eat certain foods, the bile knows whether or not there is something there for it to go to work on. “For the first half of their lives males have been heavily conditioned into believing that the conscious mind is the centre of their universe and that the ego in particular is the ruler of this universe. The problem in middle age, when the body has reached it’s climax of power and begins to decline, is to identify yourself not with the body, but with the consciousness of which the body is just a vehicle. And in growing old there is the fear of death. But this body is a vehicle of consciousness, and if you can identify with the consciousness, you can watch the body go like an old car. But it is predictable. And then gradually, the whole thing drops off, and consciousness rejoins consciousness. Out in the bush, where I now live, you can see all sorts of different consciousnesses relating to each other. There is a plant consciousness, an animal consciousness and a mineral consciousness, and we as humans share all of these because we eat these things, we assimilate, absorb, these energies along with the matter. Regarding consciousness, Fred Alan Wolf says that: “I realised that my body is a materialisation of my unconsciousness. My body is not a symbolism of my unconsciousness. It is my unconsciousness.” This gave him the connection between how addiction and the unconscious are related, saying; “Our bodies become addicted to material substances. In the same way, our consciousness becomes addicted to material form. It is an addiction or, perhaps less strongly put, a desire to have something rather than nothing.” But this opens up a whole new subject about a social problem that can be solved with an understanding of Shamanic Consciousness. 2. The unfocused, non-waking consciousness in which, we are either dreaming or unconscious of our surroundings. “Simply put, shamanic consciousness blends the focused awareness of waking consciousness with the unfocused flow of dreams, inner vision, and non-waking consciousness…. “Shamanic consciousness is a special altered state of consciousness in which the shaman is able to view his/her surroundings as a non-ordinary reality. The shaman is aware of the concrete levels of reality that include the everyday world of humankind. 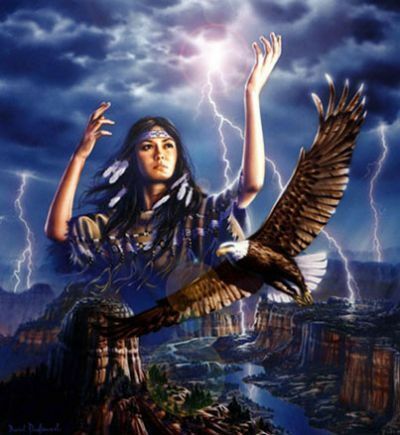 The shaman is also aware of the abstract world of Nature energies and Spirit. “For the shaman, both the concrete and abstract levels have significance, meaning, and validity. The shaman has the ability to draw information and wisdom from all levels, and the abilities to not confuse them with each other…. For a detailed understanding of shamanic consciousness I would recommend reading ‘The Eagle’s Quest - A Physicist's Search for Truth in the Heart of the Shamanic World ’ by Fred Alan Wolf. This Great Mystery can never be explained in any other form because myths and dreams come from realisations that have to find expression in symbolic form and because they are manifestations of the energies within us, moved by the organs of the body including the brain. The following, I believe is the crux to understanding life and why we have all the problems that we do. If you can follow it, it will also explain the importance of understanding the duality of our existence (see: 'Duality and the Order of Life and Energy'). People say that seeing is believing, but they have it wrong because believing is seeing. Each of us creates the reality we see from our beliefs. Recording a clear image of an object in our mind creates an object clearly in the world. We see what we want to see. This is something like thinking of an ice cream. If you think it clearly enough and often enough, you will go and get one at any cost. Creating one in the real world. According to Fred Alan Wolf, it is in Mythos, Mythic Time or Mythic Reality that nothing physically exists except as all possibilities. This is the Quantum Body, or consciousness, where will and intent live together in our conscious mind. However everything exists physically in Cronos as the real truth in our unconscious, mechanical “body-mind”, with cellular memories, desires and fears, but no will or intent, or heart and soul. So everything that actually exists, does so at the price of having no conscious knowledge of itself, and therefore relies on sending messages to our conscious mind that only acknowledges, or sees, what it wants to. So everything in our conscious mind is in the form of symbols and metaphors, and is factually false unless it has a direct communication with the unconscious “body-mind”. This communication is what is known as Shamanic Consciousness, and can be accessed when the body-mind is dying or thinks it is dying, as it prepares for it’s next stage of the universal cycle of consciousness and reaches a timeless, spaceless, non-physical, oneless. For more info on Shamanism and Psychology, Shamanic Principles, Shamanism, Physics of Shamanism, and Shamanic Tools follow the links.